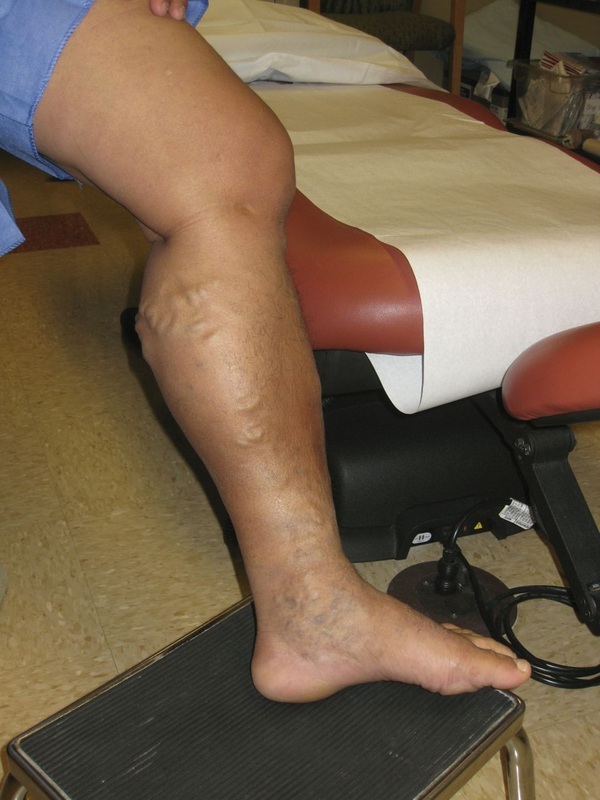 Treatment of medically symptomatic varicose veins with catheter assisted radiofrequency ablation of greater saphenous vein and micro stab phlebectomy. ...and 3 weeks after Venefit Closure procedure and micro phlebectomy. Actual patient photo. You may already know more about varicose veins than you would like, because half of all Americans over 50 (and two-thirds of women over 60) suffer from the pain and swelling of those big ropey leg veins. The condition is caused by failing valves in the primary veins that allow blood to pool up in the legs, and symptoms can range from aching and fatigue to skin ulcers and blood clots. Women who have had more than two pregnancies are at particular risk, and heredity, weight and careers that require a vertical position throughout the day, like nursing or teaching are risk factors as well. Back in the old days – the 20th Century – the only surgical option for patients with severe varicose veins was a gruesome and painful procedure called vein stripping that left the patient scarred and laid up for weeks. Today, however, we have the next-generation medical technology to treat the problem – minimally invasive catheters that close the diseased main vein from within. The physician pulls the device through the vein, delivering bursts of energy through the catheter’s heating element to heat and contract the vein walls. With the primary vessel sealed, the body automatically re-establishes healthier circulation and the varicosity symptoms quickly dissipate. Catheter devices fall into two categories – radiofrequency (RF) devices and lasers. Both are fast and effective, but I use an RF device because it is a lot easier on the patient. Laser devices operate at over 800 degrees Fahrenheit, causing pain both during and after the procedure and leaving big bruises that take a while to heal. The latest RF device, the VNUS® ClosureFAST™ catheter, operates at far cooler temperatures, sealing the vein in three to five minutes with virtually no discomfort to the patient. I do it in the office with a local anesthetic (or in the operating room), and the patient is in and out in less than an hour, usually resuming normal activity the next day. The leg pain and heaviness disappear almost immediately, and visible changes are evident in a few weeks. Clinical studies have found the new procedure to be more than 97% effective, and because it is considered a medical necessity rather than a cosmetic procedure, it is covered by Medicare and private health insurance. My active senior patients are delighted to have the zip back in their legs – and to be able to wear shorts – for the first time in decades.